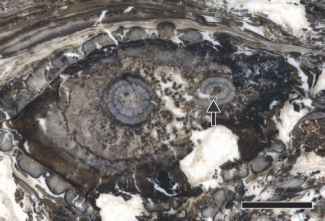 figure 9.32 Several Lepidodendron leaf cushions preserved in a Mazon Creek nodule (Pennsylvanian). Bar = 3.5 mm. represents the former position of a ligule. Additional markings occur on the leaf base in the form of vertical lines that result from lateral expansion of the stem. Rarely is preservation so good that all these features can be observed in a single leaf base. In Synchysidendron, the leaf cushion includes a groove that is formed by folding of the cushion tissue immediately below the leaf scar proper. Some compression specimens of arborescent lycopsid stems (FIG. 9.33) also provide information about the epidermis of these plants. A waxy cuticle covers the stem surface, including the leaf cushions, but is thought to be absent on the leaf scar itself (Thomas, 1966). The epidermis is simple and lacks such specialized cells as hairs and glands. Stomata are common and sunken in shallow pits (Thomas, 1974). (FIG. 9.36). Parichnos and vascular-bundle scars on the leaf scar are like those of Lepidodendron, but parichnos scars are not present on the base itself. Lepidophloios was ligulate, with the ligule attached just above the position of the leaf scar. 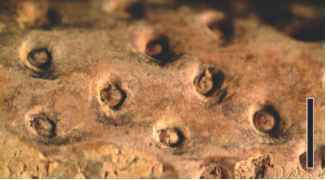 Many Lepidophloios stems exhibit large, circular to elliptical scars on the stem surface (FIG. 9.37), some up to several centimeters in diameter. The origin of these scars has been debated for many years. Some workers regard them as former sites of vegetative branches that abscised during the normal growth of the plant, whereas others suggest that they represent former positions of specialized branches that bore clusters of strobili. Historically, stems with helically arranged scars of this type have been given the generic name Halonia, whereas those with oppositely arranged scars are called Ulodendron. Jonker (1976) suggested that Ulodendron scars on the axes of Lepidodendron, Lepidophloios, and a related genus, Bothrodendron, represent the former positions of branches that abscised in a manner similar to that of some existing gymnosperms and angiosperms. Thomas (1967) regarded Ulodendron as a natural genus, basing this hypothesis on the persistent leaves, shallow ligule pits, and rhomboidal leaf bases, whereas DiMichele (1980) suggested it was congeneric with Paralycopodites. 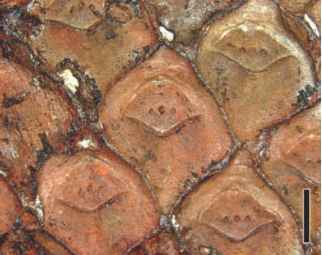 figure 9.35 Paradermal section of Lepidophloios leaf bases showing four branch scars (Pennsylvanian). Bar = 1 cm. figure 9.37 Three prominent oval branch scars along a Lepidodendron axis (Pennsylvanian). Bar = 4 cm. Species of Diaphorodendron have been delimited on the basis of internal stem organization. The configuration of the stele has been used as a taxonomic character as well as to suggest evolutionary changes that may have taken place within the arborescent forms. Knowledge of changes in stelar configuration at various levels of the stem has clearly demonstrated that many of the so-called species of Lepidodendron and Diaphorodendron as well as some of the species of Lepidophloios (FIG. 9.38 ) may represent different developmental stages of a single species. These studies have provided us with a basic understanding of just how these giant Carboniferous plants actually grew (FIG. 9.39). 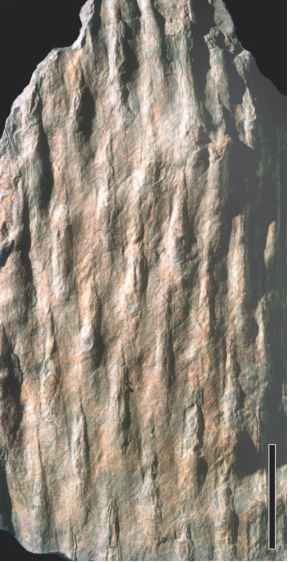 figure 9.38 Several steles of the Arran Tree (Lepidophloios wuenschianus) (Pennsylvanian). Bar = 5 cm. of lepidodendrids, that is, leaf cushions that are longer than they are wide, masks the extensive diversity present within the genus, but there are several anatomical differences as well. figure 9.39 Arborescent lycopsid (Lepidodendron) showing branch trace (B) (Pennsylvanian). Bar = 1 cm. 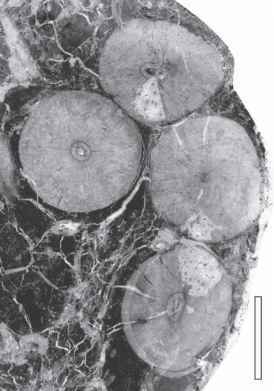 figure 9.40 Transverse section of Diaphorodendron stem showing small vascular cylinder (arrow), conspicuous cortex (C), and prominent leaf bases (L) (Pennsylvanian). Bar = 5mm. long, slender cells. This condition is often cited as evidence that the pith in lycopsids originated when immature parenchymatous cells in the center of stems failed to differentiate into tracheids. Surrounding the mixed pith is a narrow band of metaxylem tracheids with scalariform wall thickenings; protoxylem occurs at the periphery of the metaxylem. In cross section, the outer margin of the primary xylem appears fluted due to the large number of protoxylem ridges. As in most members of this division, maturation of the primary xylem is exarch. Surrounding the primary xylem in the arborescent lycops-ids may be a zone of secondary xylem, which reaches a maximum thickness of several centimeters. Unlike woody trees today, secondary xylem in the arborescent lycopsids accounts for only a small proportion of the diameter of the stem; rather, the extensive development of periderm is primarily responsible for their massive trunks. Both primary and secondary xylem tracheids are scalariform and have Williamson striations (fim-brils) extending between the scalariform bars. These fimbrils are characteristic of the wood in the arborescent lycopsids, but similar fimbrils also occur in modern club mosses and spike mosses (Wilder, 1970; Schneider and Carlquist, 2000a, b), and are regarded as a shared character for the Lycopsida as a whole (DiMichele and Bateman, 1996). Numerous vascular rays radiate through the secondary xylem; these are generally a single cell wide and up to several cells high. Due to the presence of scalariform thickenings on the walls of the ray cells, it has been suggested that xylem rays in this group evolved from tracheids. Immediately outside the secondary xylem is a zone of thin-walled cells that represent the vascular cambium. Unlike the bifacial cambium of typical seed plants (Chapter 7), however, the vascular cambium in the lepidodendrids is unifacial, producing only secondary xylem on the inner face (Eggert and Kanemoto, 1977). The unusual manner in which this secondary vascular tissue was produced was determined by examination of stems with and without secondary vascular tissue, and by comparing the distribution of cell types within the stems. In Diaphorodendron and Lepidodendron, the phloem zone is separated from the secondary xylem by a band of thin-walled cells termed the parenchyma sheath. Immediately outside the parenchyma sheath are sieve elements with large, elliptical sieve areas on their walls, interspersed with strands of phloem parenchyma. In some specimens a zone of radially seriate, thin-walled cells is in contact with the secondary xylem cylinder. Although some believe that this tissue resulted from cambial activity, others suggest it was formed of living primary-sheath cells that were capable of becoming meristem-atic. Current evidence seems to suggest that no secondary phloem was produced within the arborescent lycopsids. The cortex of the lepidodendrids is usually subdivided into three general zones—the inner, middle, and outer cortex (FIG. 9.41), which have been defined on the basis of cell types. The inner cortex is the narrowest of the cortical zones and is constructed of small, isodiametric parenchyma cells. Aggregations of cells with dark contents, presumed to be secretory cells, in addition to lacunae and various types of sclerotic cells, also occur in this zone. The middle cortex is more extensive and constructed of larger parenchyma cells. In young stems this zone is characterized by lacunae that extend radially; in older stems the middle cortex is generally not preserved, except for a few parenchyma cells along the inner and outer edges. Cells of the outer cortex show no definite arrangement. They have slightly thicker walls and superficially resemble collenchyma cells. In some species, this zone may be distinguished by longitudinally oriented, anastomosing bands of fibers. 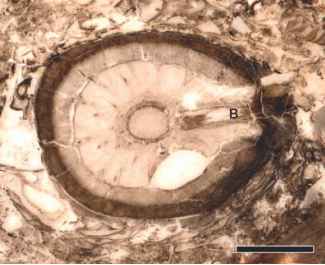 figure 9.41 Transverse section of Diaphorodendron stem with branch trace (arrow) (Pennsylvanian). Bar = 1 cm. from meristematic parenchyma cells (phellogen) in the outer cortex just beneath the leaf bases. The phellogen in the arborescent lycopsids produced a relatively small amount of phellem toward the outside of the stem, and a much larger amount of phelloderm toward the inside, the opposite of most extant seed plants (see Chapter 7). Cells of the periderm are radially aligned and often show a storied arrangement, that is, in longitudinal section, the end walls of the cells are lined up horizontally. In some lepidodendrids, the periderm is more complex and consists of three kinds of cells: (1) thick-walled, axially elongated fibers; (2) radial rows of chambered cells, conspicuous because they are divided by transverse walls; and (3) secretory cells aligned in sinuous bands that give the appearance of growth rings in cross sections. It has been suggested that periderm in the arborescent lyc-opsids formed in several ways (Eggert, 1961). Some axes show successive tangential bands of meristematic tissue at varying depths in the cortex. In this pattern of periderm production, outer cortical layers become meristematic and produce radially oriented files of cells for a period of time. As each group of meristematic cells ceases dividing, successively deeper cortical cells become meristematic and repeat the process of periderm production. The presence of short files of periderm cells in both stems and underground axes supports such a pattern of development. In some cases, thick-walled cells are produced in the outer cortex. 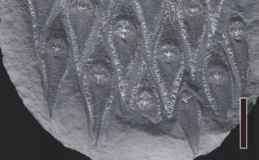 The outer surface of arborescent lycopsid stems is not the only surface to have been preserved as fossils. Both the loose construction of the cortex and the production of large amounts of relatively thin-walled periderm contributed to the sloughing off of stem layers and tissues, either as a feature of normal development or as a result of mechanical separation during the fossilization process. As a result, a variety of presumed external stem and trunk features are represented in fossils that are unlike the leaf bases and have resulted from levels of decortication of the axis. Various generic names have been applied to these decorticated states, but the names do not conform to the concepts of morphogenera and are therefore of little value in systematic studies. Nevertheless, these various fossil forms do provide information that can be used to reconstruct developmental changes in the component tissue systems of an axis. One of the more common decortication stages is Knorria, a name used for stems in which almost all the tissues external to the xylem (and sometimes even the stele) have been lost; Knorria represents a mold-cast type of preservation and is characterized by irregular, longitudinally oriented ridges. These ridges represent sediment infillings of the parich-nos strands that accompany the vascular bundles through the stem (Hirmer, 1927). Knorria casts are known not only from Lepidodendron stems (FIG. 9.42), but have also been reported from Bothrodendron and Jurinodendron (FIG. 9.43) (formerly Cyclostigma) stems. 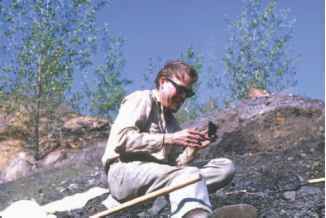 One of the outstanding contributions to modern paleobotany is Eggert's detailed investigation of development in arborescent lycopsids (Eggert, 1961) (FIG. 9.44). Studies of this type have not only contributed to our understanding of growth processes in fossil groups, but have also made it possible for paleobotanists to distinguish developmental differences represented by fossils from features that are useful in lycopsid taxonomy (Delevoryas, 1964a) . In his analysis, Eggert utilized a large number of permineralized axes with varying diameters; the axes included different amounts of primary and secondary tissues. Using this approach, he was able to reconstruct the pattern of growth in these plants and demonstrate the successful application of this technique in the analysis of other groups of plants. figure 9.43 Jurinodendron kiltorkense in Knorria-type preservation (Mississippian). Bar = 5 cm. 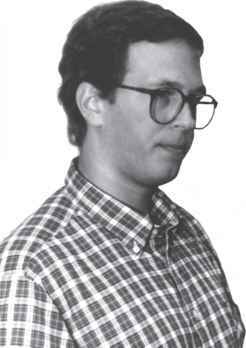 figure 9.44 Donald A. Eggert. as a result of the vascular cambium and phellogen. The increase in stem diameter results in the sloughing off of the outer cortical tissues (FIG. 9.45) , including the leaf bases, so that in older parts of the plant (e.g., at the base), the outer surface of the trunk is protected by periderm. Many of the older reconstructions of Lepidodendron in museums and drawings often err in showing leaf bases extending all the way to the ground on old trunks. At higher levels in the tree, the branches have smaller steles and fewer rows of smaller leaves on the surface. Sections of stems at these levels indicate that less secondary xylem and periderm are produced. A reduction in stele size and tissue production continues until the most distal branches, which contain a tiny protostele with only a few small trac-heids, no secondary xylem or periderm, and just a few rows of leaves. This stage in development, in which the plant literally grows itself out, has been termed apoxogenesis. In other words, the small, distal twigs of these arborescent lycopsids do not have the potential of developing into larger branches with time. This type of growth pattern is called determinate and contrasts with indeterminate growth, which is typical of vegetative development in most living woody plants. Paleobotanists must continually devise new methods of investigating the biology of the organisms they study. 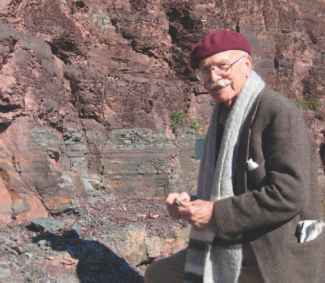 Eggert's elegant analysis of growth in the arborescent lycopsids is one such approach. In another, the focus of the study is the nature of the unifacial vascular cambium in two Carboniferous lycopsid morphogenera, Stigmaria and Paralycopodites (Cichan, 1985a). Cichan (FIG. 9.46 ) prepared serial tangential sections of the secondary xylem in order to determine the pattern of production of cambial derivatives and the method of circumferential increase in the cambium. Cichan's studies indicate that cambial activity in these plants was also determinate. Circumferential increase took place by the enlargement of fusiform initials, rather than by anticlinal divisions of existing initials, as it does in seed plants. This type of growth would result in a cambium that was limited in its capacity for radial expansion. As secondary growth ceased in the plant, fusiform initials ceased to be meristematic and matured into a cylinder of parenchyma. The leaves of arborescent lycopsids are linear and some were up to 1 m long (FIG. 9.47). Chaloner and Meyer-Berthaud (1983) demonstrated that stems with the largest diameters have the longest leaves, a feature they correlate with the determinate growth of the plants. Many of the different species established for detached leaves were probably produced by the same kind of plant and only differed in size, shape, and anatomy because of their position on the plant. The generic name Lepidophyllum was initially used for both structurally preserved and compressed lepidoden-drid leaves, but because this name had been used earlier for a flowering plant, the name Lepidophylloides was proposed in its place (Snigirevskaya, 1958). A single vascular bundle, flanked by two shallow grooves on the abaxial surface, extends the entire length of the lamina in Lepidophylloides (FIG. 9.48) . Stomata occur on the abaxial surface aligned in rows that parallel the grooves and sunken in shallow pits. A well-developed hypodermal zone of fibers surrounds the mesophyll parenchyma and vascular bundle of the leaf; no palisade parenchyma has been reported. 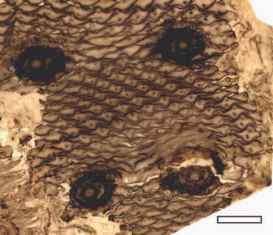 In L. sclereticum from Permian coal balls, the vascular bundle is convex in transverse section and surrounded by transfusion tracheids (S. J. Wang et al., 2002). figure 9.46 Michael A. Cichan. 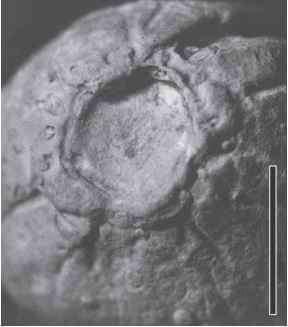 figure 9.47 Lepidophylloides in Mazon Creek nodule (Pennsylvanian). Bar = 2 cm. principal organ found in the clay layer or underclay immediately beneath most Carboniferous coal deposits. The underclay represents the soil layer (paleosol) in which these plants were rooted in the coal swamps (Mosseichik et al., 2003). Extensive specimens of Stigmaria have been uncovered in growth position, some with rootlike structures, commonly called stigmarian appendages, still attached (FIG. 9.49). Although there are several species of Stigmaria, our knowledge of the anatomy of these underground systems is based principally on the species Stigmaria ficoides (FIG. 9.50) (Williamson, 1887b) , The stigmarian system arises from the base of the trunk as four primary axes, each of which extends out horizontally, so that the rooting system is relatively shallow. Helically arranged lateral appendages were attached to each axis. These appendages abscised during the growth of the plant, leaving characteristic circular scars (FIG. 9.51) on the main axis, and these can be seen on a variety of casts, compressions, and impressions of Stigmaria . The lateral appendages are sometimes called stigmarian rootlets (FIG. 9.52), although their helical arrangement (i.e., phyllo-taxy) and abscission are characteristic of leaves rather than lateral roots (see Chapter 7). The primary axes in Stigmaria dichotomize repeatedly to form an extensive subterranean system that may have radiated up to 15 m from the trunk. figure 9.50 Cross section of stigmarian axis showing cylinder of secondary xylem and several rootlets (arrows) attached to the outer surface of the cortex (Pennsylvanian). Bar = 2 cm. figure 9.52 Cross section of stigmarian rootlet showing monarch collateral bundle (Pennsylvanian). Bar = 2 mm. 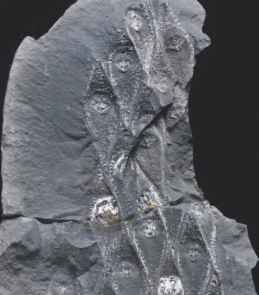 figure 9.51 Cast of Stigmaria sp. showing pattern of rootlet scars (Pennsylvanian). Bar = 1 cm. 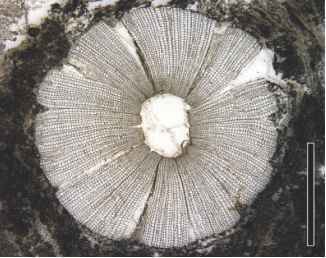 figure 9.53 Cross section of the secondary xylem cylinder of Stigmaria ficoides (Pennsylvanian). Bar = 4 mm. 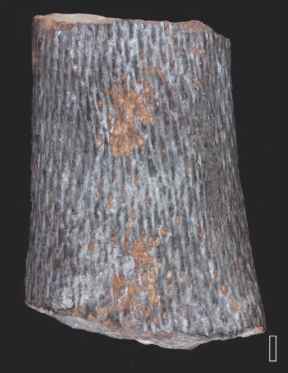 and Pryor (1991) combined observations on mold-cast specimens with permineralized axes and hypothesized that the radially aligned tracheids in the steles of many stigmar-ian axes were produced by a primary thickening meristem rather than a vascular cambium. Both primary and secondary cortical tissues of Stigmaria ficoides are complex, consisting of numerous cell and tissue systems, some of which are difficult to trace developmentally. In general, however, the production of secondary cortical tissues in the underground parts resulted in a narrow zone of periderm that is histologically similar to that of the aerial stems. A cast of the apex of Stigmaria is known from the Middle Pennsylvanian of Iowa (FIG. 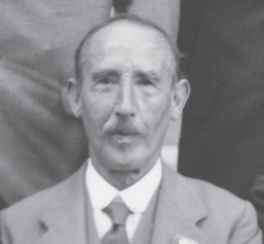 9.54) (Rothwell, 1984). The specimen is ~8.5cm long and contains helically arranged rootlet scars that surround a raised rim that is believed to correspond to the shape of the meristem. 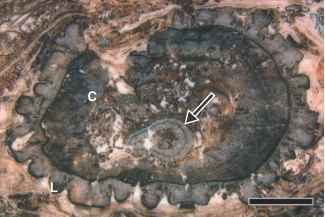 Morphologically, the specimen is nearly identical to the juvenile stage of the underground rooting structure of Nathorstiana, a Mesozoic lycopsid (Karrfalt, 1984). The lateral appendages, sometimes termed rootlets, produced by the stigmarian axes are up to 40 cm long and 0.5-1 cm in diameter, usually unbranched (some may dichotomize once), and they gradually taper distally. Each rootlet has a small monarch vascular strand surrounded by a compact inner cortex. External to this is a hollow, middle cortical zone and a thin outer cortex (FIG. 9.52). At some levels, a connective extends from the outer cortex to the inner cortex (Weiss, 1902) (FIG. 9.55, . Stigmaria stellata, from the Upper Mississippian Chester Series of Illinois, exhibits radiating ridges on the surface around the lateral appendage scars in both casts and impressions (Jennings, 1973). Structurally preserved axes suggest a close relationship to S. ficoides, but S. stellata differs in several anatomical features, including the absence of a connective in the lateral appendages. figure 9.55 Frederick E. Weiss. figure 9.57 Axis of Lepidodendropsis sp. showing leaf bases (Mississippian). Bar = 2cm. Not all stigmarian underground parts are extensive, dichotomously branched systems. Some, such as the Early Mississippian genus Protostigmaria (Jennings, 1975a), consist of cormlike axes bearing helically arranged laterals similar to those of Stigmaria. In P. eggertiana from the Price Formation of Virginia (Mississippian), both underground parts and some aerial axes are preserved in growth position (Jennings et al., 1983). 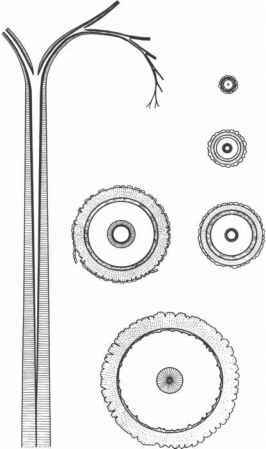 Axes are up to 32 cm in diameter and preserved as impression-compression and mold-cast specimens (FIG. 1.36). The root-bearing portion is divided into lobes by a system of furrows, with additional furrows added as the plants grew; the largest number of lobes recorded in P. eggertiana is 13. Roots were arranged on each lobe in a helical pattern; each of the scars is circular and up to 8 mm in diameter. Features of the stem surface (FIG. 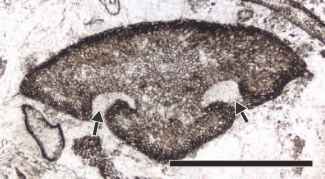 9.56) and its association in the same rocks strongly suggest that Protostigmaria was the underground portion of Lepidodendropsis (FIG. 9.57), a Mississippian arborescent lycopsid. One feature of Protostigmaria that deserves additional comment is the ability of the plant to maintain an upright position despite the relatively small anchoring surface of the lobed base. Except for the larger size and larger number of lobes, Protostigmaria is morphologically identical with the root-bearing structure of the extant lycopsid Isoetes, and this figure 9.57 Axis of Lepidodendropsis sp. 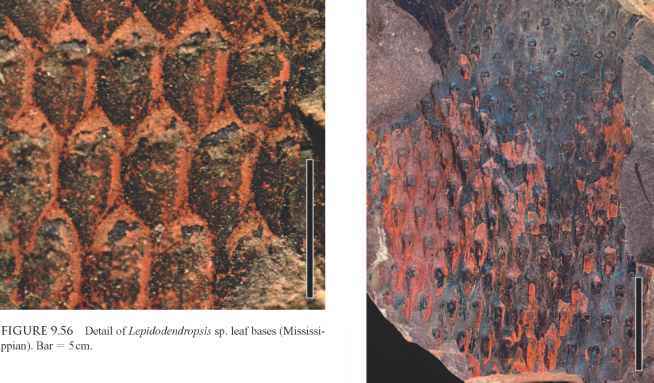 showing leaf bases (Mississippian). Bar = 2cm. further strengthens the homologous nature of the root-bearing organ of lycopsids. Experimental studies suggest that during the development of Isoetes (Karrfalt, 1977), non-contractile roots in the furrows of the cormlike base move laterally as tissues are added, resulting in the plant being pulled farther down into the substrate. It has been suggested that such a mechanism may have been operative in Protostigmaria , as it lacked the extensive, dichotomizing anchoring system of some of the other arborescent lycopsids (Jennings et al., 1983). 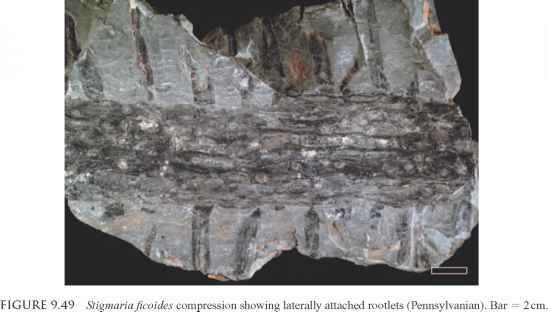 Research with Protostigmaria also illustrates that developmental data can be determined from fossils that are preserved in ways other than permineralizations. Development of Underground Organs Development of the underground parts of the arborescent lycopsids was probably quite similar to the epidogenic and apoxogenic stages described for the aerial stems. Despite the large number of Stigmaria specimens that have been collected, several features of these organs remain to be determined and interpreted. For example, the helical arrangement of the lateral appendages is unlike the irregular arrangement of roots in most living plants. No root hairs have been identified on any specimens; perhaps fungi in some of the cortical parenchyma cells functioned as mycorrhizae. The monarch vascular bundle in these so-called rootlets is bilaterally symmetrical, that is, a collateral bundle. Typically roots have radially symmetrical vascular tissue in cross section, that is the phloem surrounds the xylem, while the vascular bundles in leaves are collateral. Finally, the lateral appendages apparently abscised from the parent axis in a regular manner, perhaps similar to the process of foliar abscission in many plants. Programmed abscission of laterals is unknown in the roots of living plants and has not been observed in any non-lycopsid fossil plants. For these reasons, it has been suggested that the rootlets of Stigmaria are actually homologous with leaves that have been modified for the functions of anchorage and absorption. This interpretation implies that the underground portions of these plants arose by evolutionary modification of aerial axes (Frankenberg and Eggert, 1969). Although some of the coal-swamp lycopsids in the Pennsylvanian grew to 40 m high, the stigmarian underground system was relatively shallow, and questions have arisen as to how much support it could have provided for these towering trees. Many of these plants grew in what must have been a supersaturated soil that also provided little stability. It may be, however, that the extensive horizontal development of the underground systems was sufficient to allow these plants to remain upright. Studies of extant trees suggest that the nature of the wood (e.g., strong, dense wood) and the density of the crown can have a pronounced effect on tree uprooting (Niklas, 1992). The arborescent lycopsids had very little secondary xylem, and this may have been an advantageous mechanical property in remaining upright in heavy wind or rain. In addition, they had somewhat bushy crowns. 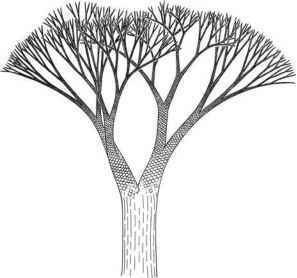 It has been suggested that the crowns of adjacent trees became entangled and thus provided mutual support for these trees in the Carboniferous swamps. What is parichnos where does it occur?